MARSHFIELD, WIS., April 15, 2015 – Nelson-Jameson has updated their extensive collection of color-coded products for material handling, janitorial, safety, lab and processing applications, with the introduction of Ultra Safe Technology (UST) Brooms and Brushes. The revolutionary new line of cleaning tools are supplied in the United States exclusively by Remco. With enhanced bristle security and unique bristle patterns, UST brooms and brushes help improve food safety and quality while minimizing the risk of contamination hazards. Other new items have also been added to expand color selections on a variety of items. The color-coded line includes several colors, including white, red, yellow, blue, green, gray, brown, black, orange, purple and pink. 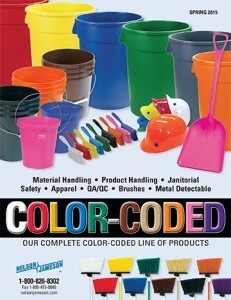 The company’s new color-coded catalog features the complete color-coded line and is available on their website, nelsonjameson.com. For more information or to request a flyer, please contact Customer Service at 800-826-8302 or visit nelsonjameson.com/colorcoded. This entry was posted in Food Safety, General, Laboratory & QA/QC, Press Room, Processing & Flow Control, Production & Material Handling, Safety & Personnel, Sanitation & Janitorial and tagged brooms, brushes, color, color coding, color-coded, UST. Bookmark the permalink. Follow any comments here with the RSS feed for this post. Post a comment or leave a trackback: Trackback URL. i need to start our color coded cleaning tools can you pls provide me a suggestions our company on do dry cleaning. Rebecca – Thank you for your interest in color-coding. 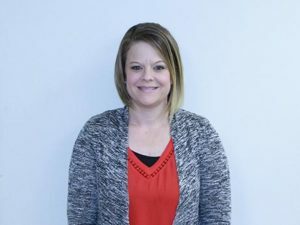 One of our Product Specialists will be reaching out to you shortly with suggestions on how you can start a color-coded program in your facility.